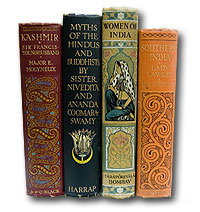 His Best Indian Stories. 288pp. Well-illustrated in colour and black and white from contemporary sources. With 29pp introduction and background to each of the 25 stories. Fine. 1987 First edition, Michael Joseph. His Best Indian Stories. 288pp. Well-illustrated in colour and black and white from contemporary sources. With 29pp introduction and background to each of the 25 stories. Fine in fine dw. 1987 First edition, Michael Joseph. A Contribution to the Needs of Our Fighting Men and their Families. 315pp. All proceeds went to the funds for the war in South Africa. Kipling contributes 'The Son of his Father'. The first appearance of the story in book form in England apart from a collected de luxe edition Very good. Bookplate. 1900 First edition, Methuen & Co.
A Story of East and West. 276pp. In original orange cloth. Preceeding the Macmillan edition of the same year. Very good. Bookplate. Owner's name. Boards slightly rubbed. 1892 William Heinemann. First English edition. A Story of East and West. 276pp. In original orange cloth. Very good. Boards slightly rubbed. 1899 Reprint, William Heinemann. A Story of East and West. 379pp. In original brown decorated cloth. A very slack copy. Bookplate. 1892 Macmillan & Co., New York. First US edition. A Story of East and West. 276pp. In original orange cloth. Preceeding the Macmillan edition of the same year. Internally very good. Boards and spine a little rubbed. Bookplate. 1892 William Heinemann. First English edition. A Story of East and West. 276pp. In original orange cloth. Preceeding the Macmillan edition of the same year. Very good indeed an excellent copy. 1892 William Heinemann. First English edition. 314pp. 16 colour plates by M. and E. Detmold. Very good. Spine very slightly faded. Light spotting to fore-edge. 1926 Reprint, Macmillan. Indian Tales III. Authorized Edition. 391pp. Scarce first US edition of 'The Phantom Rickshaw' and 'Wee Willie Winkie', bound together as issued. In plain red/brown cloth of the period. A little rubbed and faded but a sound copy. 1890 John W.Lovell, New York. 301pp. In original red cloth. Top edge gilt with gilt elephant's head on front board. Very good. Spine a little faded. Bookplate. 1909 Macmillan. First English edition. 289pp. Red leather pocket edition. Fine in neat home-made slipcase. A lovely copy. 1937 Reprint, Macmillan. 416pp. In original red cloth with gilt Ganesha device. Very good indeed. 1926 Macmillan. First English edition. Being Stories of Mine Own People. 352pp. In original blue cloth. Very good indeed. A nice early copy. 1892 Reprint year of publication, Macmillan. 365pp. In original blue cloth. Very good. A nice early copy. 1893 Reprint, Macmillan. 442pp. In original red cloth. Top edge gilt with gilt elephant's head on front board. Very good. Binding a little slack. 1917 Macmillan. First English edition. Reprinted from 'Traffics and Discoveries'. 62pp. Original buff wrappers. Very good. Bookplate. Bottom corner of front wrapper slightly bent. 1905 First edition thus, Macmillan. 310pp. In original blue cloth. Very good indeed. A nice early edition. 1898 Macmillan. Third edition reprinted. 336pp. 40 stories. Macmillan red cloth edition with gold Ganesha device. A little spotting to prelims and rubbing to spine. Binding slack. 1899 Macmillan. First in uniform edition. 284pp. 8vo. In original red boards bound from the sheets of the three Railway Library booklets. Each section retains its own title page and separate pagination. Includes `Soldiers Three' (tenth edition), `The Story of the Gadsbys' (eighth edition), `In Black and White' (ninth edition). This is the pattern for all later editions.This may be the first English collected edition bound up from the separately printed parts. The format is identical to item *** with which it makes a most attractive pair. Very good. Red cloth darkening. Sampson Low and Co., London. No date for whole volume but the first part is SIXTH EDITION 1890. 381pp + publisher's advertisments. In original blue cloth. Top edge gilt. 12 stories, set in England, India and America. Includes first appearance of 'The Maltese Cat'. Very good. Owner's name. Slightly rubbed. 1898 Macmillan. First English edition. 339pp. In original blue cloth. Very good. Bookplate. Crack in binding. 1891 Reprint, Macmillan. 80pp. In original white boards with 15 colour illustrations by F.H. Townsend. A lavishly published edition of a single story which had appeared in `Traffics and Discoveries'. Only printed on right side of each page. A story written in 1904, `hinting at Kipling's feelings about the death of his daughter Josephine' (Page). Very good indeed. Boards unusually clean. Front hinge tender. 1905 First thus, Macmillan. 296pp. 8vo. In original red boards. Each section retains its own title page and separate pagination. Includes `Wee Willie Winkie', Ninth Edition, `Under the Deodars', Seventh Edition, and `The Phantom Rickshaw', Sixth Edition. This is the pattern for all later editions. This may be the first English collected edition bound up from the separate parts. The format is identical to item ***, with which it makes a most attractive pair. Poor. Cracked and split. Sampson Low and Co., London. No dates for any of the parts. A Just So Story. 32pp. In pictorial boards. Illustrated in colour by Michael Foreman Fine 1982 First edition thus, Macmillan. A Just So Story. 32pp. In pictorial boards. Illustrated in colour by Michael Foreman. Fine 1982 First edition thus, Macmillan. A Just So Story. 32pp. In pictorial boards. Illustrated in colour by Pauline Baynes. Fine 1983 First edition thus, Macmillan. A Just So Story. 31pp. In pictorial boards. Illustrated in colour by Victor Ambrus. Fine 1985 First edition thus, Macmillan. A Just So Story. 28pp. In pictorial boards. Illustrated in colour by Alan Baker. Fine 1982 First edition thus, Macmillan. 416pp. In original red cloth with gilt Ganesha device. Very good. Two bookplates. 1926 Macmillan. First English edition.